From the Baldwin County Courthouse, go east on Hancock St. one block. Turn right (south) on Wayne St. Go straight on Wayne St. for one mile. Jog left onto Vinson Highway. 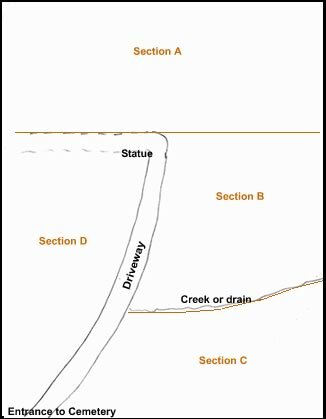 Continue on Vinson Highway (Hwy 112) for 1.8 miles. Turn right on Laboratory Rd. and go 0.3 mile. Turn left on Bostick Rd and go 0.2 mile. Turn right on Lawrence Rd and go 0.1 mile to Central Shop Rd on left. 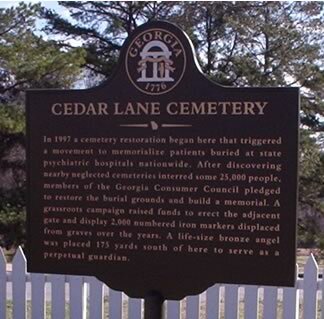 The cemetery is on the corner of Lawrence Rd. and Central Shop Rd and extends well back into the woods from this corner. Monroe County No birth or death day given. Asleep Marker in segments and in a pile. 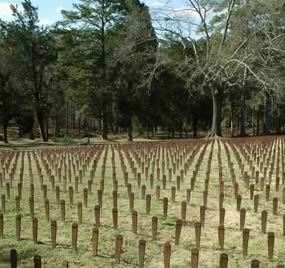 Many graves (depressions) in rows with no markers. At the entrance are 49 rows of 36 (or 1764) metal stakes that have been removed from graves in the cemetery and placed here. Many rows of graves in this area. O glorious hope, O blessed thought. Doth earthly trials done. If faithful here, we will meet again/ around our father's throne. Stone broken -- no name. Dear Father tho we miss you much we know you rest with God. In memory of our brother. Gone but not forgotten. A loved one has gone from our circle, Oh we will meet her no more, She has gone to her home in heaven, And all her afflictions are o'er. Pvt Co D 2 Ga Res. Serg Maj Co B 1 Ga Cav. Thou art gone from our home but not from our hearts.